We have a futon and it’s been invaluable to us many times. It’s served as a guest bed, yet we use it regularly as a sofa. It’s a large wooden one that takes up quite a bit of space, but makes for a good-sized bed. If space is an issue, you can get small futons as well. 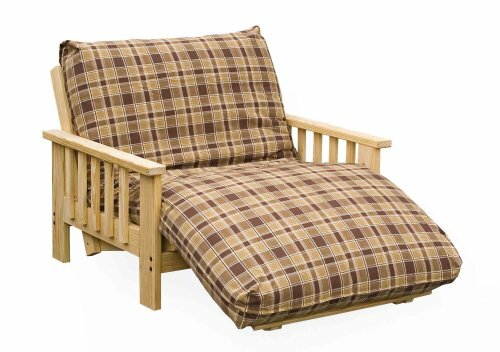 A futon can be on of the most usefully versatile pieces of furniture you’ll ever purchase. With a range of function and style nearly unrivalled by other single furniture pieces, we’ve got a list of the most important reasons to buy one. 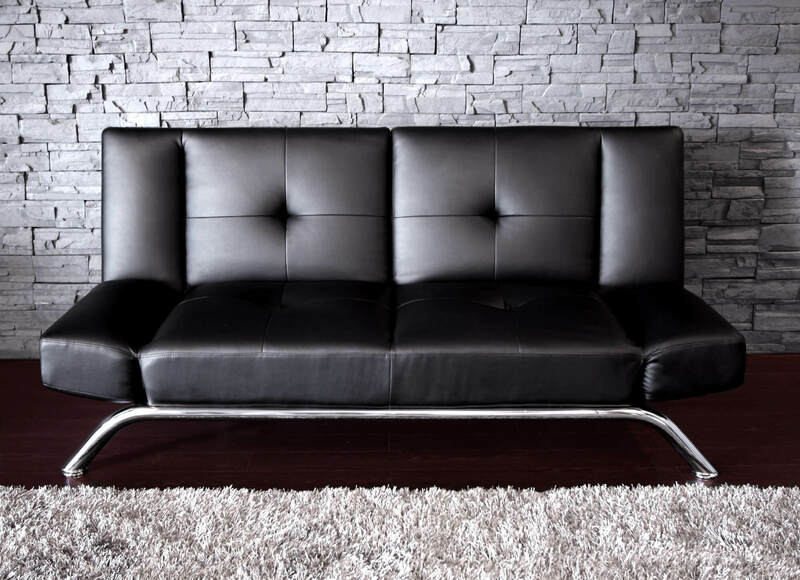 Our is a contemporary metal and leather armless futon that is stylish and functional. First of all, a futon can be a couch and a bed, seating and sleeping furniture in one piece. It takes less effort to convert from one mode to another than, say, a sleeper sofa, and far less space than having both items in a room. This alone makes the futon an attractive choice for those with limited square footage. A second reason to choose a futon has to do with limits as well: they are typically inexpensive, in relation to traditional sofas and beds. While the price can rise dramatically with the most luxurious models, the average, quality futon will set you back less than half as much as an equivalent sofa might. Another reason futons can be a perfect choice is that they are relatively simple and direct in their construction, allowing you to assemble, disassemble, and rearrange them with ease. They typically come in a box, with minimal work required to have a functioning, comfortable piece of furniture in your home. A final reason ties into the versatility of the futon. You can change its appearance to fit any style room you’d like, with replaceable mattresses – and far easier – mattress covers. Since you can purchase a frame and mattress separately, the combinations can be tailored to your exact tastes. This is something that simply can’t happen so simply with a sofa. The range of futon covers to suit any space are limitless. What about comfort? I write about whether futons are comfortable or not here. Let’s dig into the range of futons available to purchase! There are 3 main elements to a futon. These are the frame, mattress, and cover. The futon frame is the foundation of the futon. A poorly constructed frame will be difficult to convert from couch to bed and will be more likely to break or come loose. Important facets are strength, ease of use, and durability. There are many different arm styles and finishes to choose from. 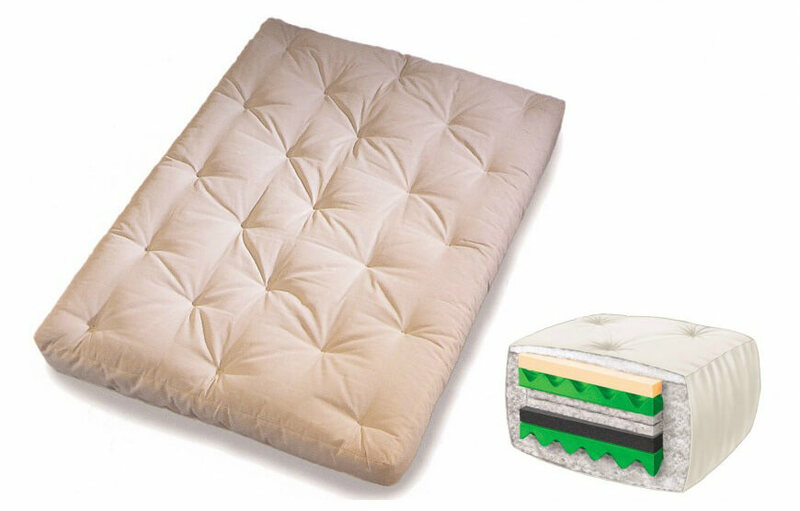 The futon mattress is the cushion used for both sitting and sleeping. 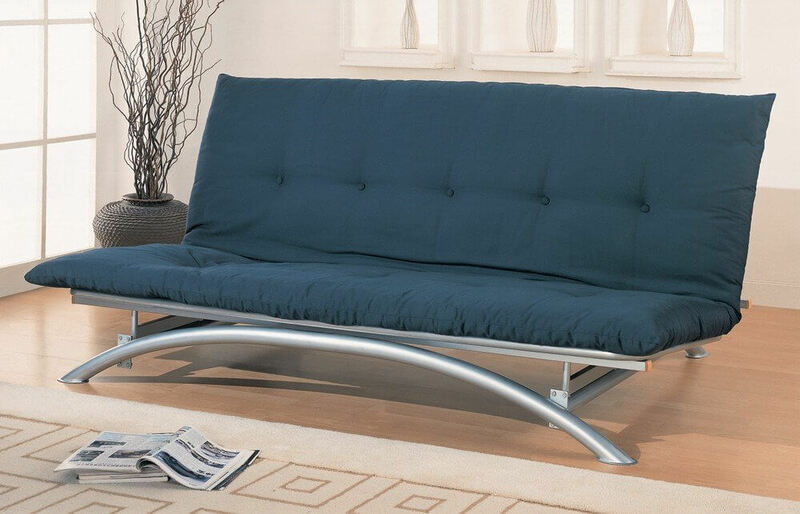 A great futon will be comfortable for both functions and will give years of sitting and sleeping pleasure. Simple cotton or polyester filled ones will flatten with use, so ones with pressurized foam or coil springs are the way to go. As the final surface detail, the cover is the most noticeable part of the futon. Here you can choose to coordinate with the surrounding environment and add protection for the futon mattress from dirt and spills. Being removable, covers can be exchanged during different seasons, rooms, and more. 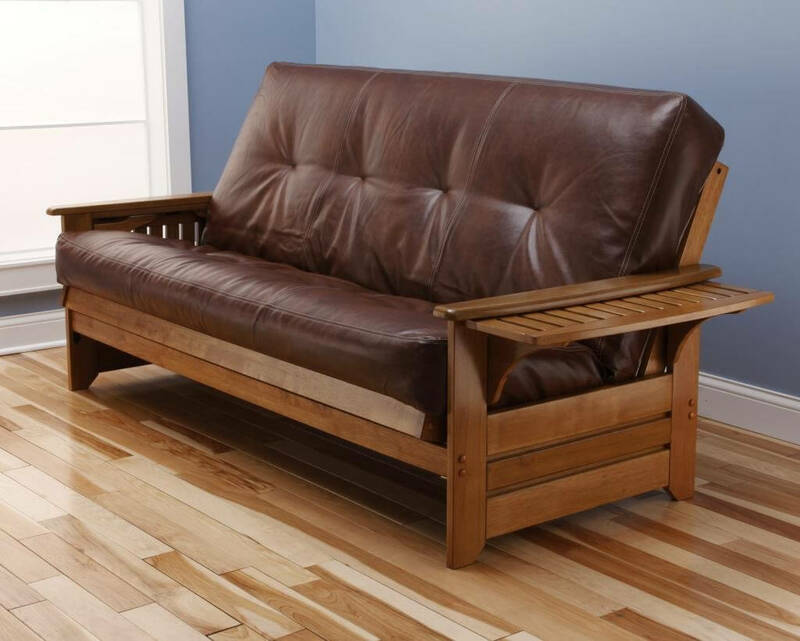 There are 3 major types of futon frames: bifold, loveseat, and trifold. The most common futon frame is one in which the futon mattress is folded in half the long way. These are perfect for couch use and everyday conversion to a bed. Bifold futon frames are available in full, queen, and smaller chair sizes. 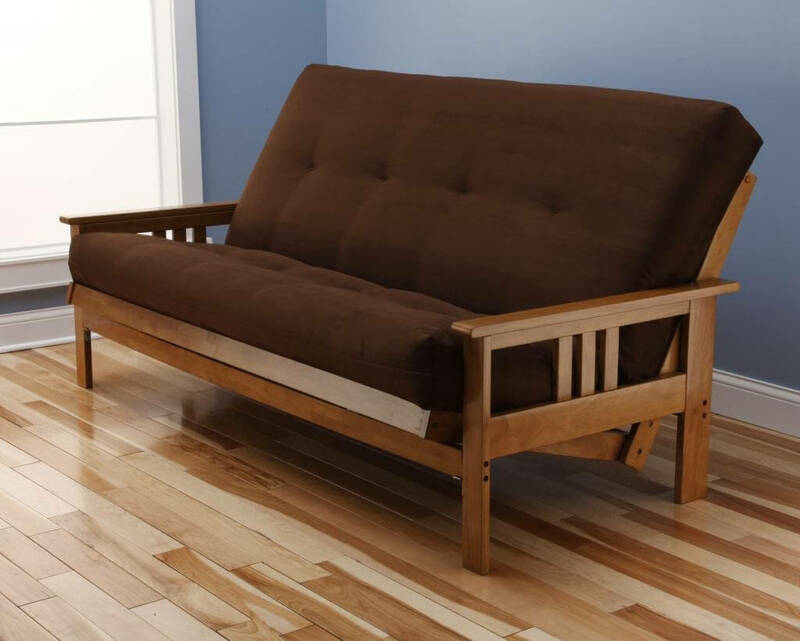 Loveseat futon frames, like the equivalent sofa, are designed for small spaces. These use a 2-piece futon mattress to fit a twin or full size bed into the smallest possible space. Perfect for efficient space usage in guest rooms, home offices, any limited size room, loveseat futon frames are available in twin and full sizes. Another great option for small spaces, the trifold futon frame folds the mattress in thirds upon the frame. Because the mattress is folded this way, only thinner models can be used on trifold futon frames. They are slightly more difficult to convert from couch to bed than bifold or loveseat futon frames, as you can see. 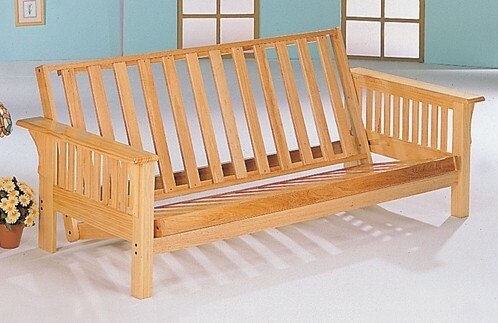 Futon frames are typically constructed from one of two materials, wood or metal. 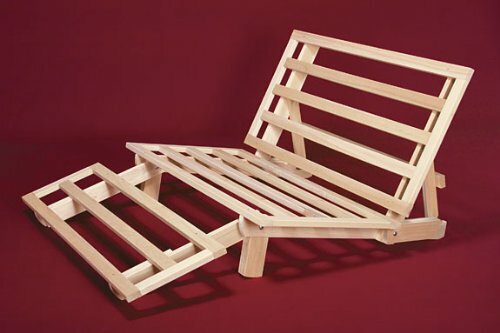 Wood frames are by far the most common construction for futons. Versatile in terms of function and aesthetics, a solid wood frame can appear in myriad styles and surface textures. 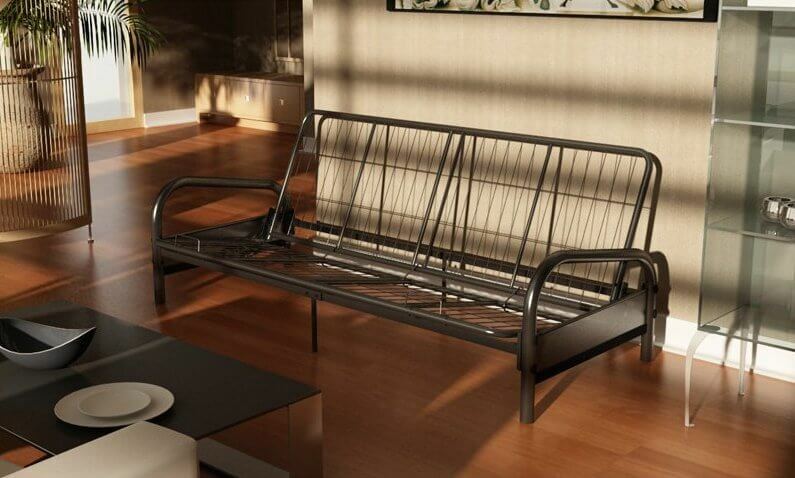 A metal frame futon has the benefit of lighter weight and, thus, more portability than a traditional wood frame. They can be molded into unique shapes that are difficult to attain with wood, and can often convert to a bed and back with more ease. 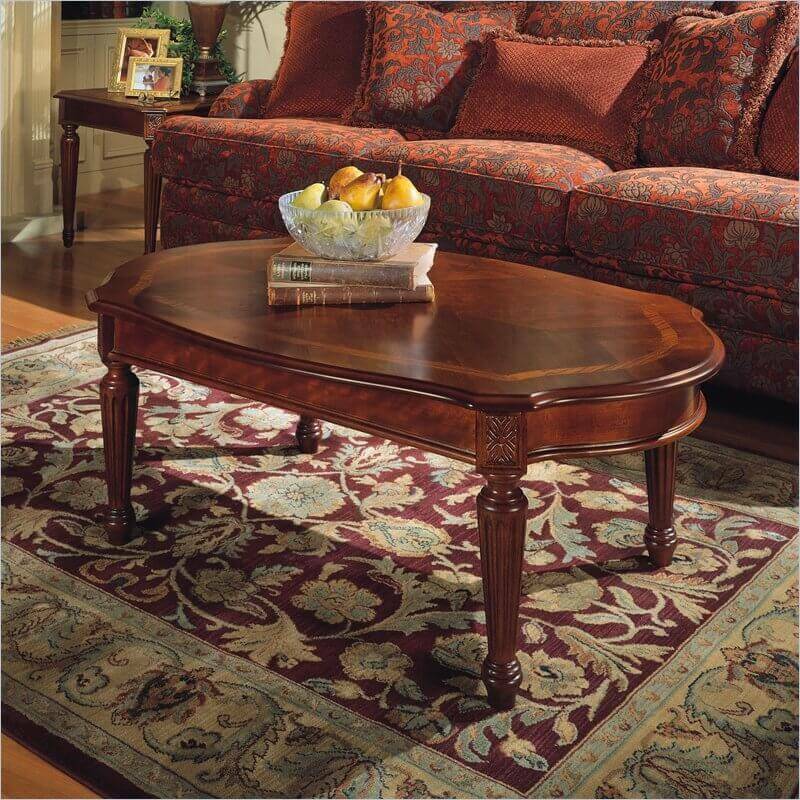 However, they are not often as ornate or beautiful as wood, and can be less sturdy. Already one of the most versatile, utilitarian single pieces of furniture, futons also come in a range of playful styles and configurations. 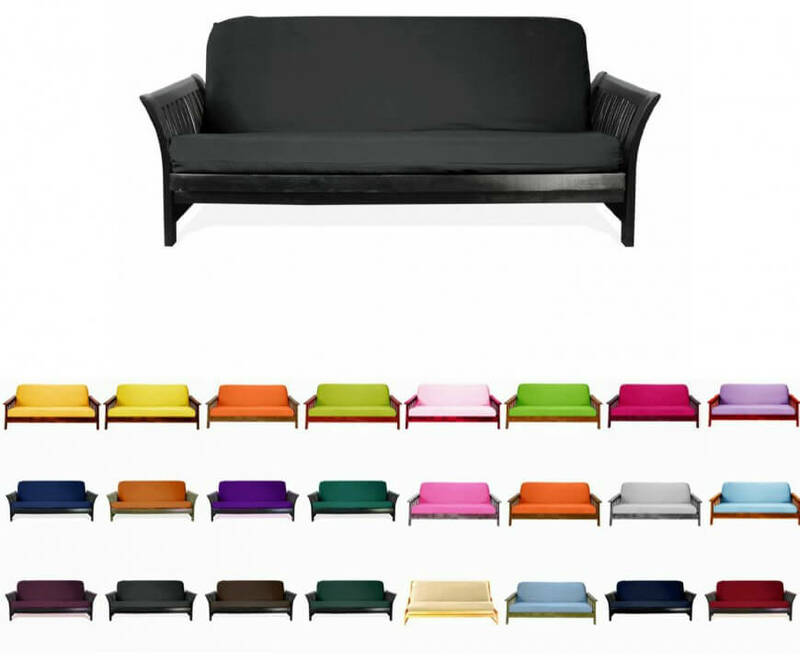 The traditionally shaped futon most closely resembles a classic sofa. These will have full arms, with either matching or perfectly paired mattress and frame combinations. Some are fully upholstered for a unified look, completely obscuring the frame itself. The number one advantage to an armless futon is, when in sleeping mode, the bed can be far more comfortable for tall folks, or anyone who moves around during sleep. In its bed configuration, the armless futon appears more naturally like a traditional bed. It can also make for a more sleek sofa configuration, and fit multiple sitters with a little more room. The lounge futon is a more relaxed affair, made for, yes, lounging. These models can supplement more traditional furniture in a living room, or make a relaxing halfway point between sitting and laying down. Many models have multiple notches for varying increments of recline, from upright to fully flat. Possibly the most innovative, and definitely the most elaborate futon design, these are a perfect centerpiece for any child’s bedroom or dorm room. 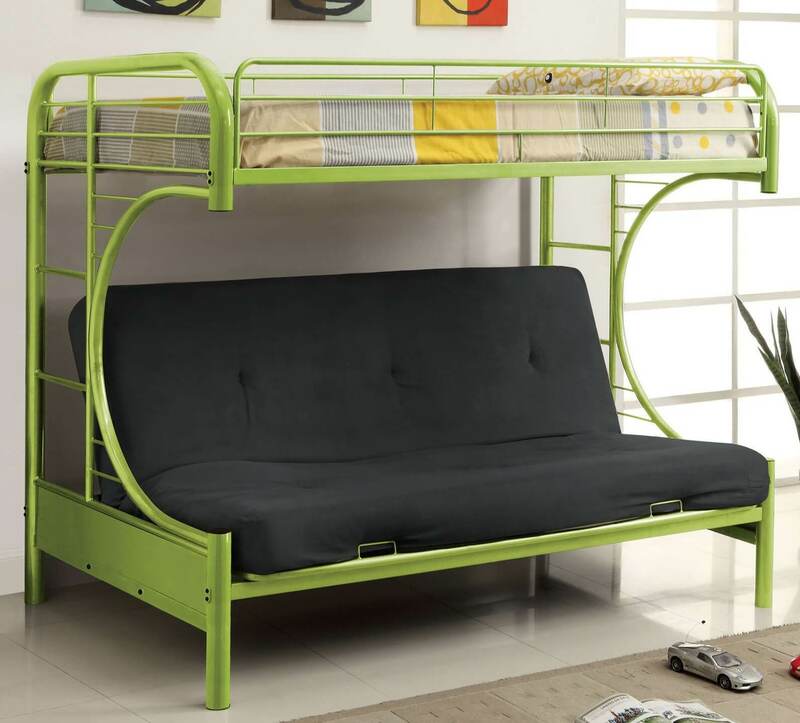 Combining the traditional futon setup with a full bunk bed frame, they allow for seating and two full beds in a compact space.